Jamon, with Seven Places Productions, is highly efficient and reliable. His superior coding skills have finessed my projects time and again. He takes initiative and delivers finished work exactly to my very critical design eye. Jamon’s core values and integrity parallel his business and it makes the experience of hiring him a pleasure. We, at Five Loaves Creative, look forward to working with Jamon for years to come. After years of working with a generic template based website with limited functionality we decided to build a custom solution from the ground up. Jamon and Seven Places rose to the challenge building an incredible website with increased functionality, a professional and user friendly interface, and a simple yet powerful backend Content Management System. Service after the sale has been an added bonus with Seven Places. Jamon has been attentive to our needs in answering questions and providing training. Our members and staff have been extremely pleased with our new web presence as evidenced by the positive comments we continue to receive. If you desire a professional design/development company that does it right the first time and can take your web presence to the next level, I would not hesitate in recommending Seven Places Productions. Speed, efficiency and quality. 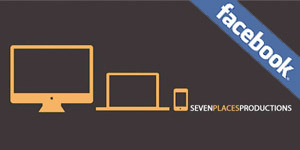 Those are the primary items needed in our projects and Seven Places Productions delivers. In working with Jamon, it feels like an extension of our team. He understands us and our needs and impresses me every time with his results. Jamon Abercrombie and Seven Places Productions took my existing website and totally re-worked it – turning our site into a professional, easy-to-navigate, very productive (sales wise) website! I appreciate the creativity and hard work provided in such a short time period of time. Not only do I have a dear friend, but an awesome web site!